As entertainment professionals, we tell stories all the time. We spend most of our time thinking about the stories we’re going to tell to our fans, to the people who watch, listen to, or read the stories we create. We tend to spend less time thinking about all the stories we tell to our customers (whether that’s advertisers or, say, the producer who might buy our script), our coworkers/coperformers, our friends, and even ourselves. With that in mind, let’s talk about the value of those other stories. To start the conversation, here’s a link to a fascinating NYT column. There’s so much depth to it that you should read the whole thing. That said, I’ll break it down for you quickly. The column is about an independent minor league baseball team (meaning one that can sign whichever players it wants). Bear in mind that sports = entertainment; nothing more, nothing less. That’s why great athletes, with their extremely unique skills, make much the same kind of money that great actors and directors do. Their story can teach you a lot about all the stories you tell. 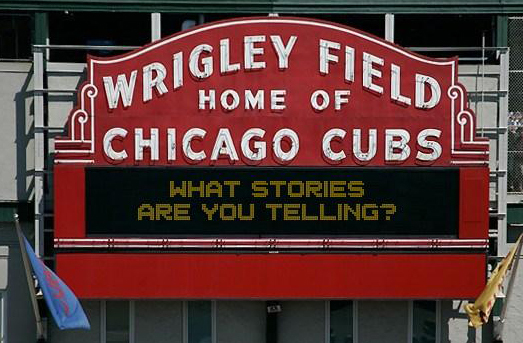 When you run a baseball team, you need to tell several great stories. 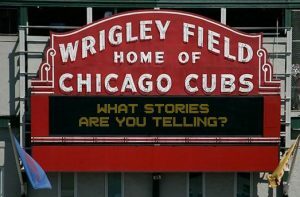 The obvious story is the one you tell your fans: you should come out to our ballgames because we’re great family entertainment for a great price, and we’re going to win a championship! It’s easier to miss the stories you have to tell to your advertisers, luxury box buyers, and your employees – especially your most unique employees, your players. The independent baseball team hired two very experienced data nerds run things. In some ways the nerds succeeded, but they’re very clear about how they failed to meet all of their goals. In their own words: “We should have come up with a better story.” The story they failed to tell properly was to their employees, specifically their players. For starters, they positioned themselves to a group of baseball players – performers who are not exactly known for their open-mindedness – as data nerds who understood statistical analysis. They made a worse mistake than mispositioning themselves, however: “We made it about us.” Given that the “us” in question was two statistics nerds and the audience in question – young baseball players – was not likely to be open to “data analytics” from statistics nerds, their message was bound to miss its target audience. Sure enough, their players – and another key employee, their manager – routinely ignored the advice and directions that they’d spent hours compiling, and while the team did well, they also lost games because of that. I’ve got personal experience with making that mistake. I did almost the exact same thing with the first morning show I ever managed. I dropped a very similar line on my morning guy about how he should accept my coaching because I was so dang smart. Oops. He was about as open to my coaching after that – and I did have a lot of valuable input for him – as the nerds’ baseball team was to theirs. I failed him badly because I made the story I told him about me, rather than him. I learned a very valuable lesson at his expense. (If you happen to be reading this Stan, sorry!) Luckily, I did learn my lesson and did much, much better with every morning show after that. There’s another curveball in the baseball story (baseball pun not intended, but I’ll take it): the importance of messaging was driven home by a young athlete named Sean Conroy. The nerds signed him because they thought he would turn into a relief ace for their team, and he quickly proved them right. Then he came out, becoming the first active gay professional baseball player. We’re all aware of the stories we tell on the air, on film, on the printed page, or online. We’re always paying attention to those stories. In the process, we often forget about the rest of the storytelling that’s just as important to our success. Actually, everyone in every field tells stories – not one, but lots of them. Are you telling all the right stories not just in the most compelling way possible, but in a way that will make your audience open to the story?